It is important to give kids options that can help them reduce stress and manage uncomfortable emotions. I meet many adults who have limited self care resources and because of this they now have a hard time managing emotions and stress. By teaching children techniques to address uncomfortable feelings early on we are giving them valuable tools they will be able to use into adulthood. 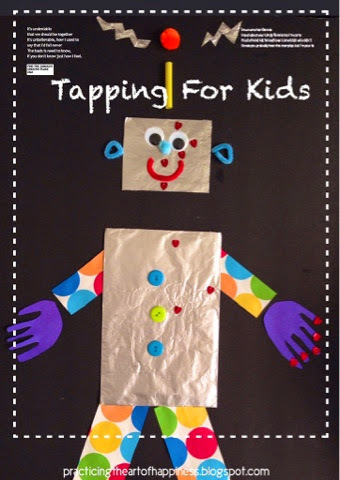 Tapping is a great way to teach children how to practice self care. In a nut shell, when we have an uncomfortable emotion it is believed in ancient philosophies that our life energy (chi) is disrupted, by tapping on acupressure points while thinking of the event/feeling that caused it, we allow chi to return to it's full flow. The WHO, World Health Organization, has recommended acupuncture for over 60 different ailments. Acupressure is similar to acupuncture except that you apply pressure or tap with your fingertips on the energy points on your body instead of placing tiny needles in them. I have made diaphragmatic breathing, yoga, meditation and tapping part of our family life.I practice tapping differently with my 5 year old then I would with adults but it is still very effective in reducing stress and easing strong emotions. I gently tap with my middle and index finger, approximately 5 taps on the following points (they are outlined in the image above with red hearts). I will tap on my son or he will tap on himself as I guide him before going to bed, while cuddling and watching TV, after he's had a melt down, lately right before a melt down which helps relax him. Giving children different ways to manage their emotions sets them up to be empowered beings now but also helps develop happier adults. Tapping combines acupressure, NLP, and cognitive behavioral techniques. It is beneficial in making uncomfortable emotions manageable, releasing unhealthy thoughts, creating greater relaxation and reducing physical pain. First, name the emotion or sensation you are feeling and give it a number from 1-10 (10=the most and 1=the least). 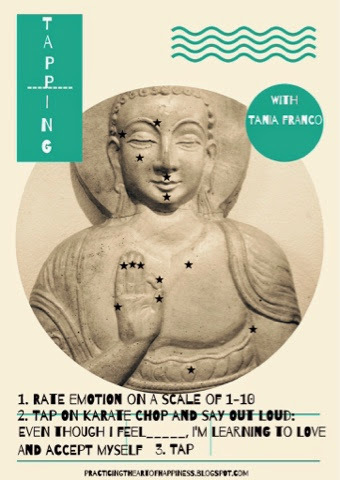 Tap each point gently 7 times on each acupressure point while focusing on the emotion or sensation. Make sure you are taking deep breaths throughout the exercise. Reassess the number (0-10) of the emotion/sensation. When I was in my early 20's I dreamed of the day I would become a mother and how much art and play would be at the center of my parenting style. Now with a 6 year old I can proudly say that we have made arts and crafts a part of our daily life. I realize how much all of our activities have helped shape his view of the world. He will see something he likes and automatically knows that we can find a way to make it. No matter what. 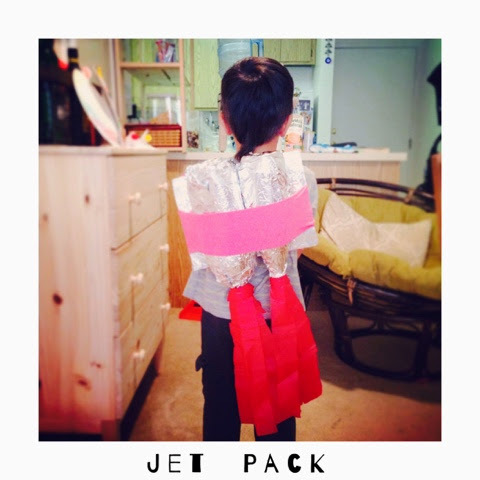 The other day we were at a play date with friends and he saw this amazing jet pack made with recycled materials. As soon as we got home I looked it up on Pinterest and added it to my After School board. 1.We covered the water bottles and the cardboard with aluminum foil. Put a a little bit of scotch tape to hold it together. 2. We looked for something to use as a strap. I suggested an old T-shirt but my son wasn't having it. Every shirt possible was called his "favorite". I tried to explain that 10 shirts can't all be his favorite but I lost that battle so I looked for a pair of tights that could do the trick. (Yes, I once bought bright Pepto Bismol tights. My husband, bless him, didn't let me leave the house with them on, so they were available for the craft.) I cut 2 legs for the shoulder straps and a third piece to hold the water bottles to the cardboard. 3. I hot glued the water bottles to the cardboard. 4. Hot glued and later stapled the straps (pink tights) to the cardboard. 5. Hot glued and stapled the strap that hugged the water bottles to the cardboard. 6. Cut the tissue paper into 10 strips, put 5 of them together and stapled them, then stapled the other 5..
7. Hot glued the tissue paper onto each the water bottles. Voila'! He ran around the house all day playing with it. Finding creative ways to come together as a family can be truly rewarding for all and can be empowering for children.